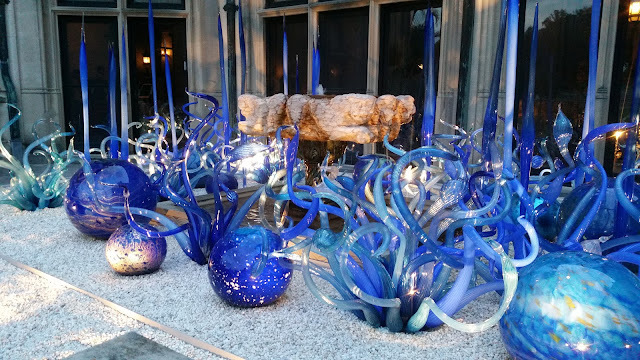 I just spent an amazingly blissful long weekend in Asheville, NC, where we took in a Chihuly exhibit at the Biltmore estate. Given that this was all about art glass, I went with a glass fleck polish for the weekend. Red Night Sky was one of a quad released by Glitter Gal as Brilliant Shade Shifters - each of these was a duochromatic glass fleck that's fine to use as either a topper or solo. 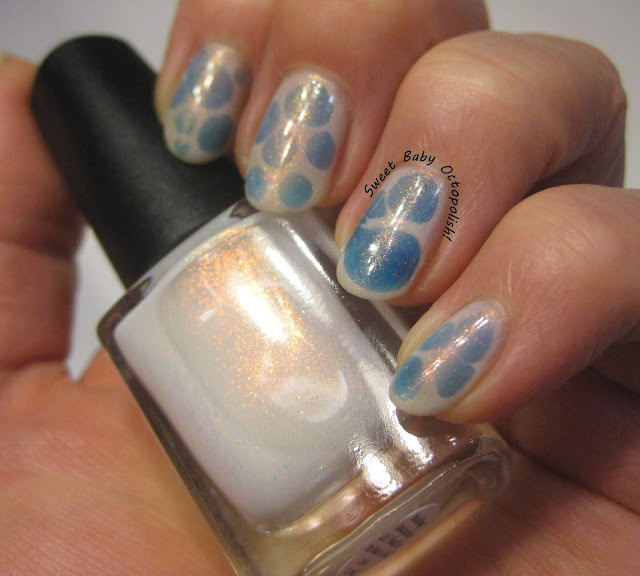 Since I prefer to have these type of jellies build up to the base color, I usually like them solo at a few coats better, and it took me 3 coats to get to the opacity you see here. The first coat goes on extremely sheer, but instantly packed with all the sparkly glass flecky goodness you see here. Red Night Sky (really, all of these are very aptly named) is a warm but desaturated red, somewhere between brick and coral, brought to life with sparks that shift from a cool blue on over to a very hot pink. This weekend, a wicked clever amigo invited me to go along with her to "America the Game Show. F*ck Yeah!" and informed me that dressing up ridiculously (a la old school 70s and 80s game shows) was highly encouraged. Somehow, this ended up translating to my nails needing to be money. Ms Andry's Bath House sent me this mini called IDGAF as part of a goodie box a couple of years ago. It's a warm gold holo microglitter, and that's it. Straight up, nothing else to distract you from the fabulousness, here you go. In the sun, this stuff was delightfully blingy, without being blinding. You know, tasteful but super fun. And once I saw it in the sun on the way to work, it proceeded to rain all over the East coast for the entire rest of the time I wore this mani, so you'll just have to believe me. I've started here with a base of a England Tristam, a perfect formula navy blue scattered holo. 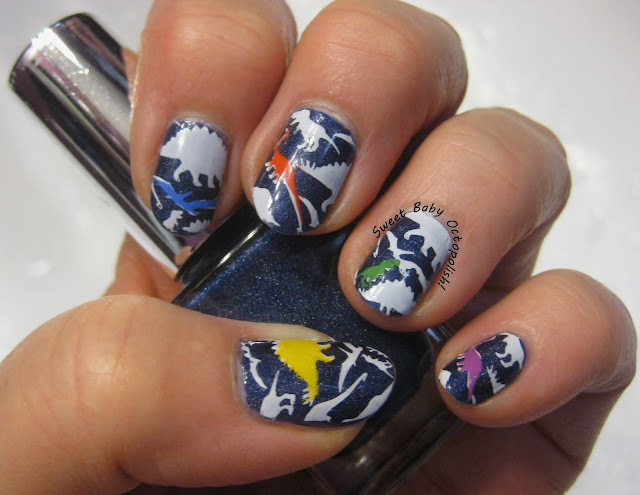 The jumble of dinosaur cut-out shapes in white is from Vivid Lacquer VL-014, and once that layer was completed, I stamped a single image on each nail with a different brightly colored Esmaltes da Kelly crème polish. The final look reminds me of the sort of stuff any kiddo would be super excited to decorate their room with - I'm imagining a bed set + curtains in this pattern! The man picked "metallic" for my start point to dig into my mountain of untried polishes this week, and flipping through swatch sticks of silvers, golds, and coppers I was struck by how I'd never used any of the Ms Sparkle polishes I own. Ali Baba was part of a 2015 collection themed around the 1001 Nights tales, all of which appear to be sheer duochromes with UC flakies in them. Most all of the swatches I could find of this polish are over black, and the first coat is so light but even that you could 100% get away with this as a topper that would give you a smattering of gold dust + flakies over your base color. Wearing it over black, though, emphasizes the duochromatic nature of the shimmer while drowning out the base color, so I'm showing 3 thin coats solo - this built to opacity pretty well, with absolutely minimal texture from the flakies. I excitedly picked up Bo'dier Baby from Don Deeva several months ago with the possibility that it was a close match for my beloved Mystic Glacier, and though it's a gorgeous color in the bottle, it's ultimately far too sheer to use on its own. It occurred to me that a great way to get a thicker layer of the color was to bead it into another polish using a blobbicure technique, and Llarowe's Building Sandcastles seemed like a great match. Building Sandcastles is a beautifully wearable white crelly with both Clarins 230 type shimmer and aurora shimmer of the same red-to-green shift. The pigments and the moderately sheer finish warm this right up from a stark white and make it nicely flattering with my skin tone. For a deep jungle green base I started with Tonic You'll Move Mountains, and for the dinosaur hide base I instead started with a stone grey crelly on my middle fingers. The amazingly detailed velociraptor eye is from the top image on HeHe 086, part of their delightful science series of stamping plates. Though the design is complex with very fine lines, I had no trouble picking it up on the first try. The eye was stamped in black, then filled in with Esmaltes da Kelly Pleiades on the stamper head before placing it on the nail. The leaves are from different parts of MoYou London Tropical plates 06 and 12, using Esmaltes da Kelly Carmelo and Emily de Molly green stamping polishes. As per usual when stumped for the next color, I asked the man to suggest one, and after a thoughful moment he came up with "rose." I interpreted that as anywhere along a spectrum of pink to wine, but ultimately picked something rather rose-like from stem to petals. 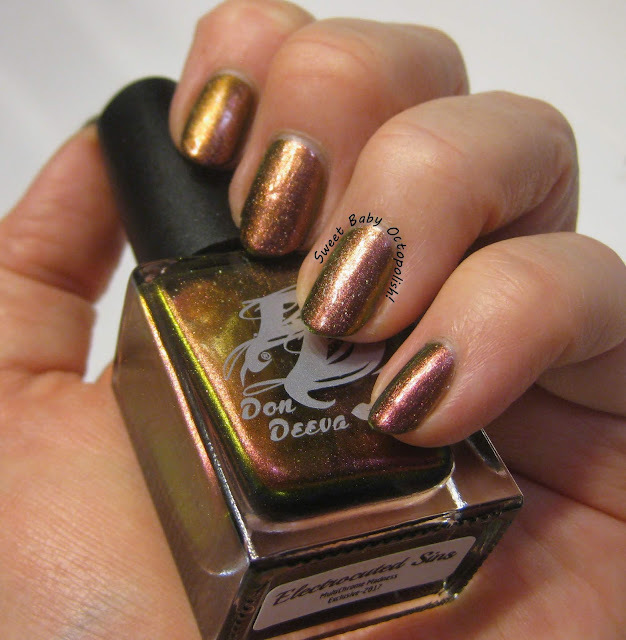 Don Deeva created Electrocuted Sins as one of an exclusive trio for the facebook group Multichrome Madness back in November of 2017. I was lucky enough to win a set, and this is the 2nd of that trio I've worn. And finally hits a super glowy emerald green. I just love themed nail art - whether that's for holidays, book club, prompts, or any excuse - because it really gets me out of my same-old same-old as far as colors and design go. The 4th of July is certainly no exception, but with the messed up state of our country right now, I'm really not feeling super patriotic with red, white, and blue flags waving proudly on my fingertips. What I am feeling, though, is a whole lot of love for people pulling together, a sense of community, and finding hope and love in each other. For the 4th this year, I'm going with bright stars shining out of the dark. For this month's selection, my book club picked 'H is for Hawk' by Helen Macdonald, easily one of my most favorite books I read last year, highly recommended for animal lovers, appreciators of gorgeous wordsmithing, and book-reading humans in general. Since I'd loved the book so much, I of course felt the need to put together themed nail art for the club meeting. The base color is Llarowe Shroom With a View, a fave of plenty of folks back when it came out in 2015 (yet again, years for me to use pretties in my stash!). It has a rich scattered holo finish of the type that you can usually only find in a England's offerings, and a deep taupe base color that has to be one of the classiest modern neutrals I own. Two thin coats brought this to complete opacity, and the formula was great.